Well it’s been a while, hasn’t it? I promised a whole slew of foundation reviews on a very regular basis and there hasn’t been one since Clinique’s Even Better Glow, which was months ago. It was also, admittedly, a hard face base to follow and I didn’t really want to stop using it to test anything else. Light, fresh, dewy, it made me look as though I’d actually had sleep – you can read the review of that here if you fancy a lovely foundation to see you through the summer. 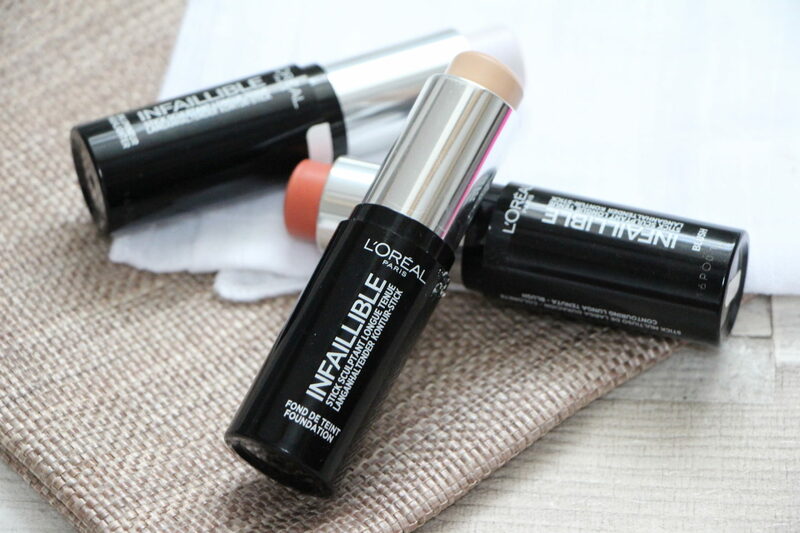 But the base I’ve been using more than any other, at least for the last month or so, has been the L’Oreal Paris Infallible Shaping Stick Foundation. It’s excellent. I thought that I was totally sold on cushion foundations, that I would use them forever until death we do part and that they would have to be prised from my cold, lifeless grip. But then I realised the true brilliance and convenience of stick foundations and wondered where they had been all my life. 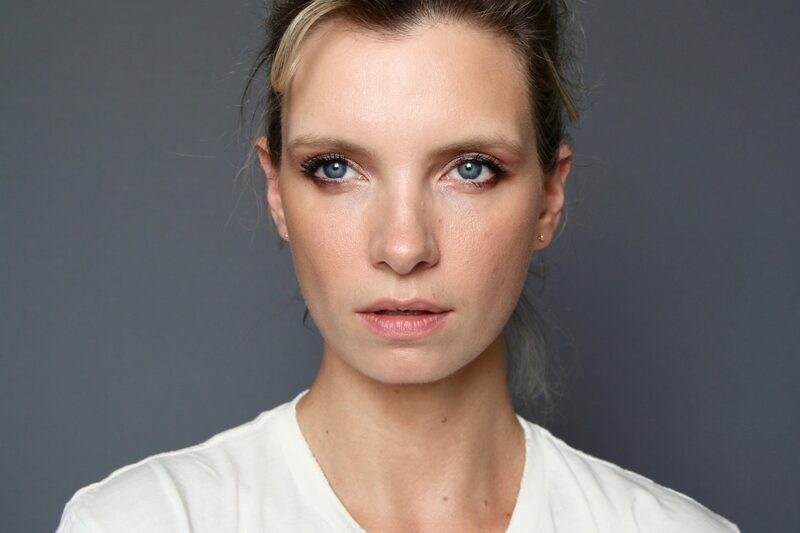 In fact stick foundations have been around for ages, but I’ve often found them to be too greasy. Quick to apply, easy to blend, but oily on the t-zone after just a few hours. 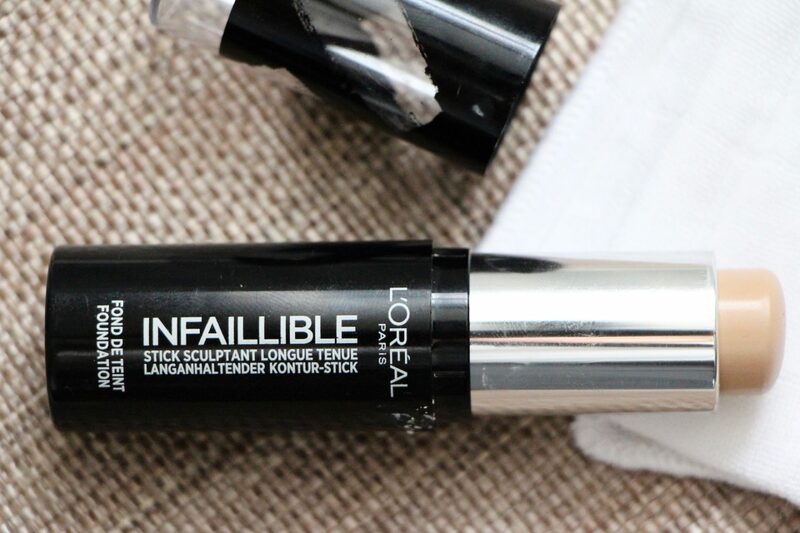 Not so with L’Oreal’s Infallible Stick. The Stick. It’s creamy on application, slides and blends like an absolute dream but then sets into a velvety, non-greasy finish. So the finish is good, then, on the Infallible Stick – so is the longevity. I mean it’s not like Double Wear or one of the thicker, fuller foundations, not by any stretch of the imagination, but it’s still on after a longish day so no complaints here. 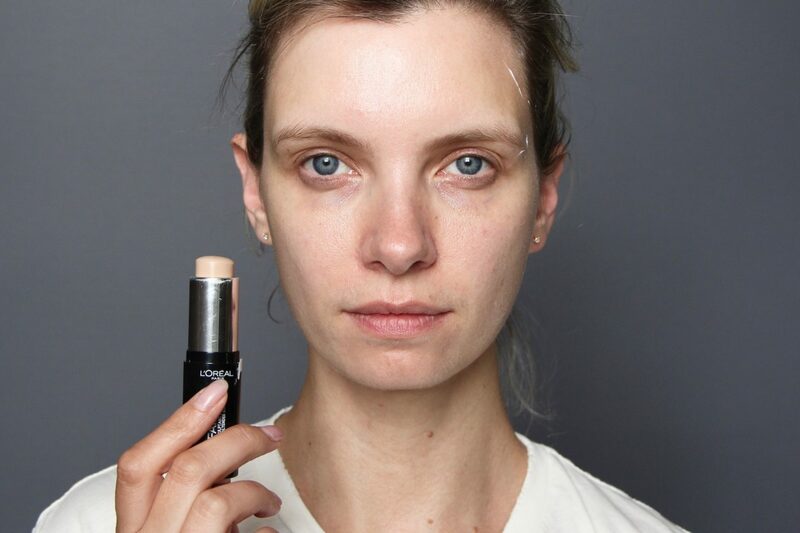 If you were specifically looking for a foundation that sticks like glue and covers a multitude of sins then this one isn’t for you – coverage is on the sheerer side of medium, unless you build it up (see notes below) – but if you want absolute convenience and a blendable, flexible sort of formula that looks non-cakey but stays in place then read on. Enough of my nattering: here’s the before and after comparison. 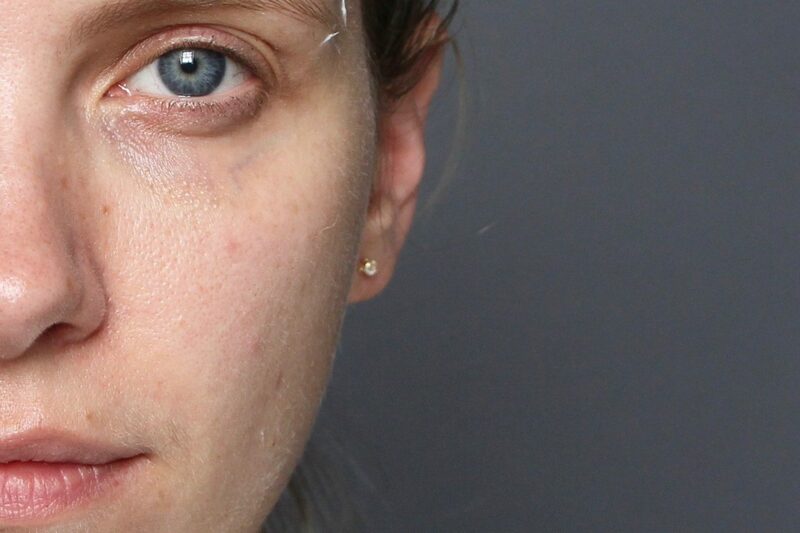 You can see that the coverage here is relatively sheer, but there’s an evenness to the finish that’s impressive after such a light application. 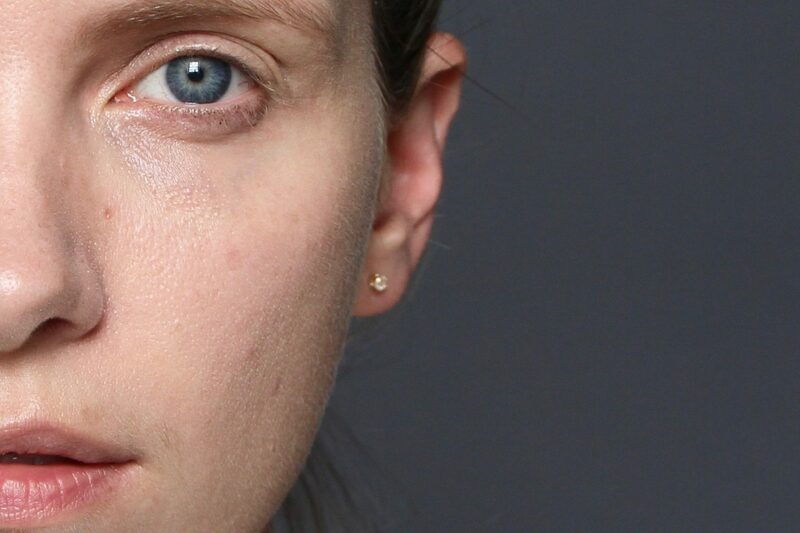 Although I think it’s easier to see it on the zoomed-out photos, as the little red blemish marks on my cheek are quite distracting. Maybe not as distracting as the blobs of face cream (for God’s sake! ), but still. If you did a full face, built it up properly, you could get a very perfected result, but that goes against my reasons for using this stick. I use it because it’s quick. It blends easily. If I want to faff about for ages getting the ultimate Instagram Face then I would probably use my Dior Forever Mousse or something and blend it in painstakingly with a brush then a sponge then a microscopic chamois leather stuck to the end of a cocktail stick. 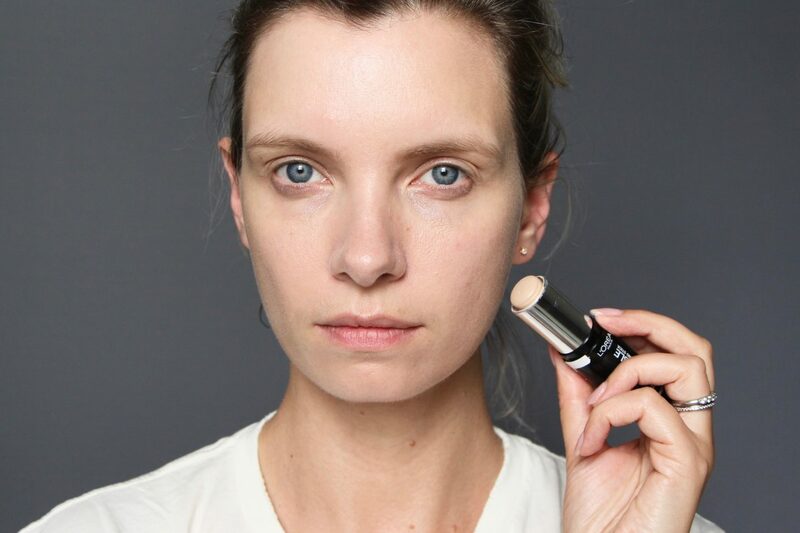 As it stands, if I’m just doing a normal day, and I’m not on camera or appearing at an event or doing something where people will take photos of me without realising (and I’m always mid-word, mouth gaping like a fish) then the Infallible Shaping Stick Foundation does me just fine. Pigmented, creamy, smooth to apply, quick to set but above all: convenient. 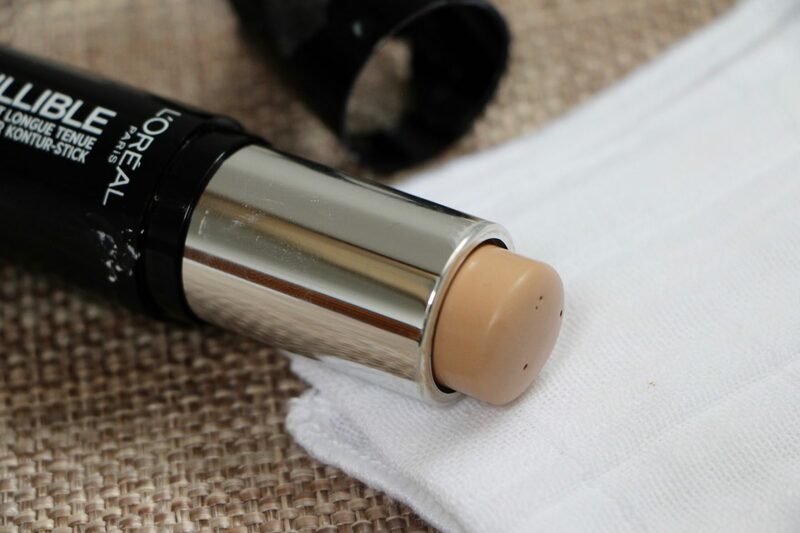 You can find the Infallible Shaping Stick Foundation at Amazon*, Boots* and FeelUnique* – it comes in twelve shades and costs £8.99. It’s currently £6.53 at Amazon here* and £6.25 at FeelUnique*. I use shade 140, but I reckon I could get away with a shade darker for the summer months. You can read all of my foundation reviews here. Please note: I am part of the L’Oreal Beauty Squad, but content associated with that role is always very clearly marked “AD”. Any other inclusion is purely editorial and unsponsored.